Eva is a complex character aware of her own faults and self-delusions. Do you identify with her or her situation, and if so, how? What is Eva seeking? Do you think she finds it? Eva feels trapped in the boredom and solitude of home but does she have other options? What do the different approaches in tone and language in Eva’s interactions with her past and present lovers (Adam, Xavier, Harry) say about her relationships with them? What do you make of Eva’s relations with her children Katya and Christophe? Are they uneven, or even but different? What stood out as your favourite part or section of the book and why? Which moved you most: plot, descriptions, dialogue, themes, metaphors, the writing itself? Despite her efforts to ‘fit in’, Eva often feels displaced. At one point she refers to a Polish philosopher who says you find feelings of ‘exile’ result more from your own shortcomings than external circumstances. Do you agree? Many names in Forty One draw on biblical allusions, as do certain roles that characters play. What did you make of the references you found? The repetition of certain images/metaphors is a device used throughout the novel. Which of these stood out for you? (Curtains, red slip, butterfly wings, black box, nausea, cross, gravel, changing of seasons/nature as a backdrop). The author also repeats certain words to allude to Eva’s progression in her thinking and spiritual journey. What do you make of the recurring use of the words ‘come’, ‘the word’, 'let go' and ‘okay’? Did you agree or disagree with Eva’s view about nothingness, that it can’t be a workable proposition? 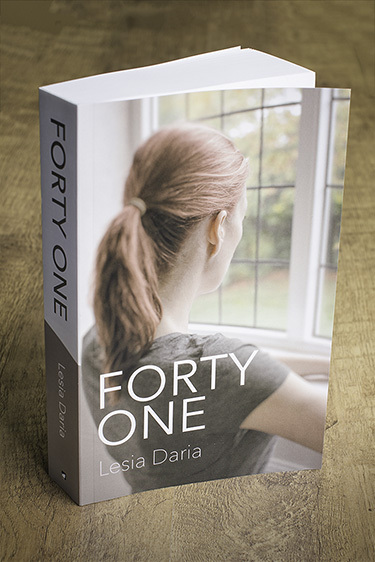 Forty One is Eva’s age at the start of the novel but also represents her year-long journey towards ‘42’, a search for meaning. To make sense of her life, Eva turns to various things: common sense sayings, making peace with the past, trawling through ideas in philosophy and belief in religion. Are any more useful than others, or are they all a necessary part of the journey? Does Eva find meaning or peace or resolution in the end? Would you recommend this book to others, and if so, how would you sum it up? A ‘mid-life crisis’ tale, a critique of modern life, a story about the search for meaning, all of these? Do you have any questions for the author? If so, please write to her at contact@lesiadaria.com, a reply is guaranteed!